In the late '80s, a team of Disney artists were working on a pitch for an updated version of Rocky and Bullwinkle, to capitalize on the success of Ducktales and Rescue Rangers. Everything was going fine, until they realized the lawyers had messed up when they cleared the idea: Disney owened the video distribution rights to the existing cartoons, but Universal Studios still owned the characters. 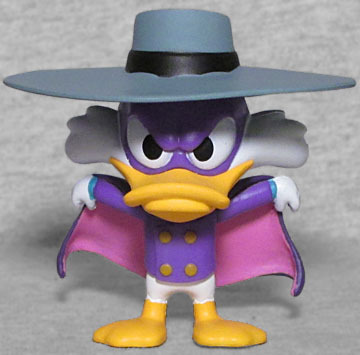 So with only days left before their scheduled pitch meeting, they fell back on an idea that spun off from a Ducktales episode where Launchpad was mistaken for a spy: but this time they got ahead of the lawyers and, realizing that the James Bond people might take issue with a show called "Double-O Duck," changed the name to the more Batman-inspired "Darkwing." 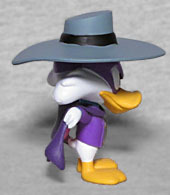 Darkwing's original character design was a very plain, Donald/Daffy look with a round head and a flat bill. 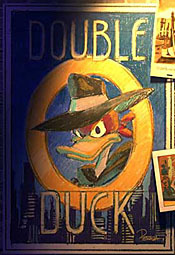 Toby Sheldon tweaked that, adding big fluffy cheek feathers that seemed to owe a debt to Roger Rabbit, but also helped set Drake Mallard apart from his Duckburg cousins. This Mystery Mini is posed in a suitably dramatic fashion, holding his own cape open and looking sternly at whomever it is he's trying to intimidate. The purples on his mask and cape, and his jacket, are different enough not to blend together, and the pink lining of the cape helps that even more. They even remembered to do his teal turtleneck! Unfortunately, the cape and that massive hat of his combine to make him a slightly back-heavy figure, so he'll tend to fall over easily. You might need to heat and re-shape his legs.